The best Pixar movies, as chosen by children: Critics love Inside Out, but kids love the sequels. This survey was conducted after the release of Pixar’s last movie, Monsters University. The results are reprinted here ahead of the release of Pixar’s next movie, Inside Out. Amid all the reports of Pixar’s sad decline, there’s one group whose voice has been underrepresented: that of our kids. So we interviewed more than two dozen children and relatives of Slate staffers, asking them to name their favorite and least favorite Pixar movies. The results were surprising. Overall, children were more persnickety than critics, giving 11 out of 14 movies lower ratings than critics did. Moreover, their favorites frequently differed from those of the critics: Cars 2, for example, declared a stinker by critics, was among the most popular Pixar films with children, rating even higher than the original. But almost half of the kids hated Finding Nemo, a movie that achieved a near perfect rating (99 percent positive reviews on Rotten Tomatoes) from critics. And while many critics see the quality of Pixar movies falling off, children see Pixar movies as better than ever. To illustrate this, we’ve graphed the Rotten Tomatoes ratings of each Pixar film over the years, comparing critics’ ratings with the percentage of positive responses from children. 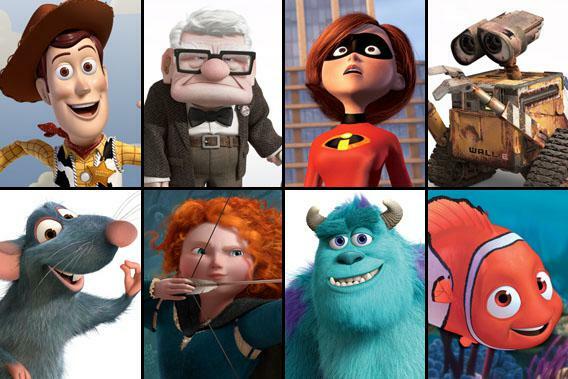 Herewith, the best Pixar movies, from best to worst, as chosen by our children. Fans of Brave really liked the scene “when the bear was naked” (Franny, 8, and Gideon, 4). Jacob, 10, also “liked the Brave’s bravery.” But twins Max and Alex, 5, numbered it among their least favorites, explaining that they didn’t like the scary witch and “the very scary bear, MULDOON.” (His actual name is Mor’du.) At least one kid agreed with many critics, celebrating the fact that “for once the story has a female heroine” (Pearl, 9). Nearly half of our child critics disliked Finding Nemo, complaining that it was “overhyped” and “very predictable” (Noa, 12), “a little weird” (Lizey, 9), and “went overboard with fantasy” (Jacob, 10). Nemo’s fans, on the other hand, explained that they liked it “because there’s a turtle that’s so funny, it swims away” (Lily, 6), and because they “liked the fish” (Franny, 8).